Are you interested in developing food products of the future with enhanced nutritional benefits? Do you want to make a difference to consumer health and wellbeing? If so, apply now for the Bachelor of Applied Science in Nutrition, Food and Business Management. Over the course of this four-year degree you will study nutrition and food science to develop your knowledge and understanding of contemporary issues in food and nutrition, nutritional requirements through the lifecycle and the interplay between nutrition, diet and disease. Culinary skills and sensory analysis techniques will be perfected to provide students with the necessary skills to develop food products. Students will also study a wide range of marketing and management modules to provide an understanding of consumer trends and the food industry. In the final year, students will apply nutritional knowledge and culinary skills, along with research and marketing techniques to develop new innovative food products ready for the market. 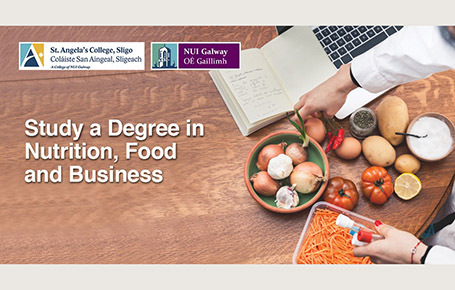 Find out more about the Bachelor of Applied Science in Nutrition, Food and Business Management structure and entry requirements here. Year 3 of the programme incorporates the possibility of a structured 20-week placement nationally or internationally in a variety of food industries and food related organisations such as Kerry Foods, Glanbia, Lakeland Dairies, Aurivo and Island Seafood’s Ltd. This innovative and unique programme is offered by St. Angela’s College, Sligo, a College of the National University of Ireland, Galway and a provider of University education in the North West of Ireland. The Campus is ideally located on the scenic shores of Lough Gill and only a few minutes from Sligo town. Easy access and good transport links to Sligo allow students to choose to either live on-campus or to seek accommodation in the nearby town. Sligo is a safe, student friendly and welcoming town which provides a lively, social, cultural and entertainment scene. Click here to find out more about student life at St. Angela’s College.